I took this pic from the parking lot :) Isn't it magical? This week's castle is Eilean Donan on the Isle of Skye. I drove from Inverness to the Isle of Skye earlier this year to see this castle. The drive was amazing, and the castle well worth it! Eilean Donan was built on an island in the middle of Loch Duich. You may have seen the picturesque castle with its stone bridge. There is a central tower and walled courtyard. Surrounded by water on all sides, the enemy had only two ways to reach the castle -- by water or by bridge. Either way, the guards would have seen them coming. The castle had the perfect defensive position. The castle was a stronghold for the Mackenzies of Kintail. Robert the Bruce sheltered there in 1306--which was the prime reason I used the castle as his base in several of my Stolen Bride books (though I used creative license to move that date back a bit.) In 1504, the castle was captured by the Earl of Huntly, and severeal years later the MacRaes took charge. By 1539, the MacDonald's laid siege to Eilean Donan. By the 17th century, the Mackenzies had gained enough power to take back their castle. Their chief was titled Earl of Seaforth. During the Jacobite era, they had Spanish troops garrisoned there, but unfortunately for such an amazing castle, three English frigates battered the castle with canon fire. When their fire barely breached the 14 foot thick walls, they sent their men ashore, and those occupying the castle surrendered. As if surrendering wasn't enough, they lit 343 barrels of gunpowder, letting them explode within the tower, crumbling Eilean Donan. The earl stripped of his lands and titles (which the clan later regained but the title became extinct in 1815), the castle would stand in ruins until the 20th century when it was rebuilt. The castle as it stands today, is a rebuild. Bought by Lt Colonel John MacRae-Gilstrap and his wife in 1911, he spent the next twenty years reconstructing the castle to its former glory (with a few added perks like electricity!). Eilean Donan remains a residence to this day--however it is open to visitors. Check out the pics from my visit! We weren't allowed to take pics form inside, so I only have some from the outside. One of my favorite pics I took of the castle--see the reflection of the castle in the water? This is a picture I took from the right side of the bridge. Standing at the gate and gazing down the stone bridge. Me on the beautiful bridge to Eilean Donan! This is a view of the castle after walking to the end of the bridge. Imposing and awe-inspiring. It really takes you back. The reconstruction really did justice to this medieval castle. Stone stairs near the front of the castle leading down to the shore of Loch Duich. Main doors leading to a small inner courtyard. Can you see that little square? That's about my height, so the doors were very tall. An arrow-slit window several yards to the left of the main door. Stairs near the back leading down to water and a large walking area. Once we crossed through the main door, these curling stairs were to the left. Standing at the bottom of the circular stair and looking up. That is the door into what was made into a billiard room, but in my stories, it served as hall for warriors. At the top of those same circular stairs looking down. That arch leads to the main door. From the 3rd story a picture out the window. Standing behind the castle, I took a pic of the loch. From behind the castle, a look up the imposing walls. Again from behind. I wandered into the grassy area and took a pic. Check out my award-winning, best-selling Stolen Bride series! and releasing later this month... 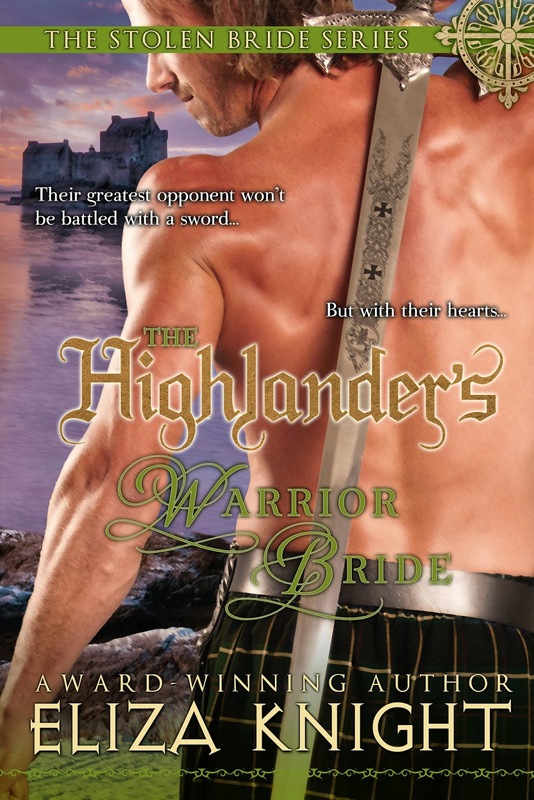 The Highlander's Sin! Visit my website, www.elizaknight.com to sign up for my newsletter and find out more about upcoming releases!